The popular blue oyster mushroom is one of the most common of the oyster mushrooms used in cuisine world wide. Most mycologist agree the blue oyster (pleurotus columbinus) mushroom is a sub strain of the pearl oyster (pleurotus ostreatus) mushroom. Young specimens will be blueish color on their caps, then changing color to grey tones upon maturing. Also the more light introduced, the bluer the caps will become. 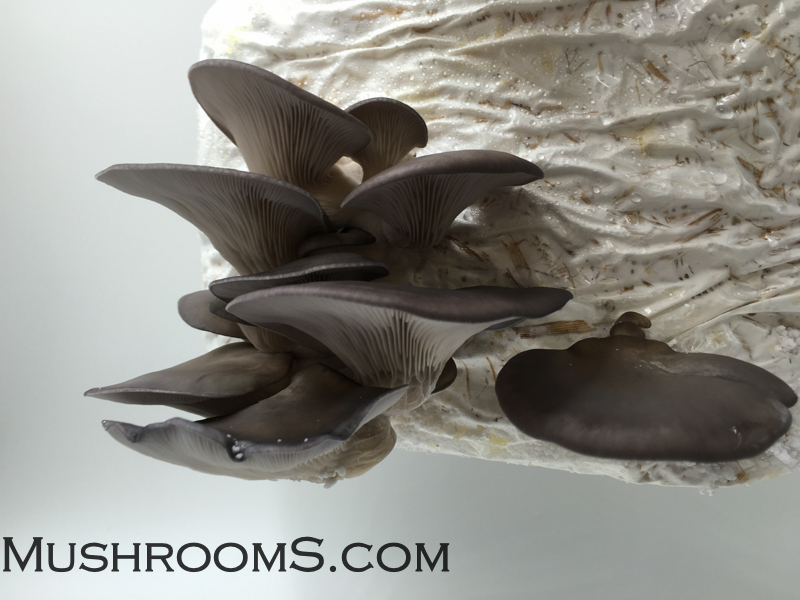 This is the reason wild forest blue oyster mushrooms are much bluer then indoor cultivated mushrooms. We personally like growing our blue oyster mushrooms outdoors with indirect sunlight in clear plastic tubs because they take on the deeper blue color instead of grey tones. Also this mushroom prefers colder temperatures then other oyster mushrooms. In our warm climate we can only grow this mushroom about 5 months out of the year since it prefers cooler temperatures to fruit, unlike it’s cousin the pearl oyster can fruit in higher temperatures. We find the blue oyster mycelium tolerates higher temperatures better and contaminates less often when the Arizona heat sets in. But the only way we can get it to fruit is keep it outdoors when temperatures are below 65F. Our indoor growing facility does not get cold enough to fruit this mushroom. This mushroom loves low temperature drops and even does best when morning lows are around the 40’s and 50’s. Our friends in the mountain region grow this species on a large scale and you can see from this picture, this fungi being left indoors it will not produce the deep beautiful blue tones like we produce in smaller tubs outdoors. And just for the record, we do not accept spores from our friends who grow like this because the spores of many mushroom species get thrown all over the grow room and cross spore contamination occurs, which is not good for a spore business. However growing in big bags like this is great for producing mushrooms for restaurants and farmers markets. 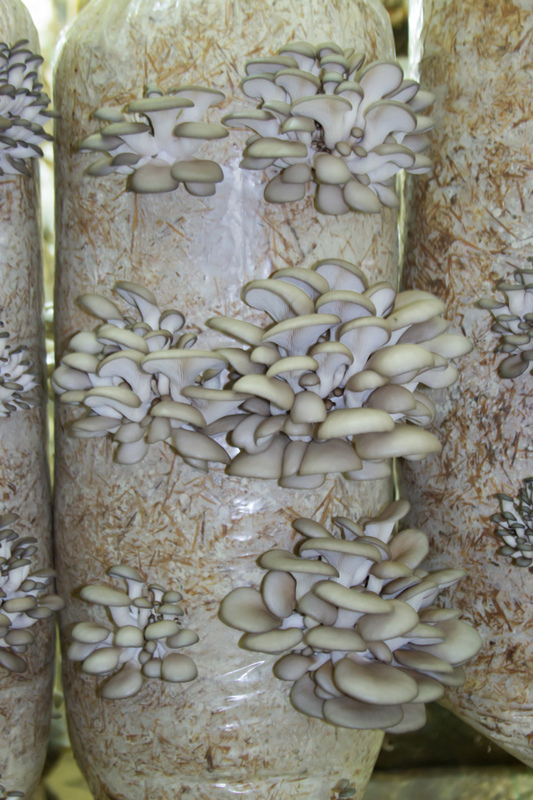 Not only is the blue oyster mushroom delicious, but it's one of the easier varieties of oyster mushrooms to grow. This mushrooms grows on a wide range of substrates including straw (wheat,rye,oat,rice, and barley straw), corn, coffee grounds, banana waste, most hardwoods and hardwood by-products like sawdust and paper, compost and much more. This mushroom truly thrives throughout temperate regions of the world. Currently we stock liquid culture syringes and spore prints of oyster mushrooms from clean organic lab cultivated mushrooms.